I was recently reading a whitepaper on the value of mobile business apps to help organizations, both large and small, across various industries – from direct store delivery to home health care, state and local government, construction and field services. Smart phones, tablets, and mobile apps have truly transformed the way we communicate, play and manage our personal lives. According to recent surveys half of all U.S. adults own a smartphone or tablet. Considering that was prior to the holiday shopping season and the typical wave of post holiday shoppers that “may have not gotten what they wanted” and head out in, we can be pretty certain that this percentage is even greater today. 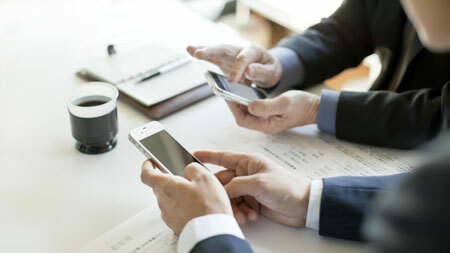 With this increasing number of users, the same transformation to these devices are taking place in businesses where they are becoming nearly standard issue tools for every member of a mobile workforce or Bring Your Own Device (BYOD) policies are bringing these devices into the everyday work environment. Field staff, who regularly work out of their car or truck, often rely only on a phone and are abandoning the clipboard and multiple, duplicate forms for apps they can fill out right on their Smartphone or tablet. Here are five specific benefits your organization should consider if you haven’t already made the decision to build an enterprise mobile app to improve workflow, ensure higher quality data and work details benefiting both your overhead, your staff’s productivity, and your customer interactions. Better data capture from the field. When your field personnel are able to capture key customer data through a mobile app, you reduce tremendous amounts of paper forms, greatly increase the accuracy of the data collected and that information can be shared enterprise wide literally instantaneously. Improved job management to get more work done each day. Sales, service managers, dispatchers, and parts managers are just a few examples of the company personnel that can use an enterprise app to communicate job details directly to field personnel. These details could easily contain the customer address, the parts required to complete the job and even past activities with this specific customer. Enterprise Mobile Apps can be designed to capture customer signatures, job site photos, QA symbol scans of all materials used on the job. All the data is captured with time and location stamps. Organizations can not only measure what materials really are consumed on a project, they can use the time data to develop an accurate history of the length of time certain jobs take to complete and build labor rates and scheduling practices based on this accurate, from the field, information. Decreased payroll costs and processing time. With mobile apps recording an employee shift start/end time and breaks right on their mobile device, employers can gain control of overtime pay and ensure actual work hours are truly being completed productively. By directly integrating this field data into your payroll service, you can eliminate the costs and resources historically involved with processing payroll. While employees may not want to feel like their every move is being scrutinized, it also can make their work day flow much smoother. If they need a part, a dispatcher can locate over field personnel and cross check to ensure they have the part with them. If an urgent customer service call comes in, dispatchers can send the closest field staff, saving fuel costs and increasing response time. While some companies may want to try to configure your Enterprise Mobile App needs into their predesigned app, you likely will need to make great compromises of features your organization really needs.